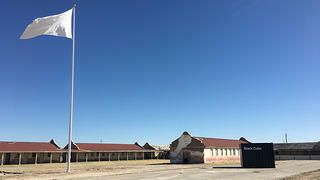 As of today, visible from the El Paso–Juárez horizon, a new flag stands as a marker for Rio Vista Farm, the last known standing bracero (Mexican guest-worker) processing site. Now on view through May 31, 2018, Unearthed: Desenterrado is the latest outdoor, site-specific installation by Texas-based artist Adriana Corral. Unearthed: Desenterrado is produced by Black Cube, a nomadic contemporary art museum, based in Denver, Colorado, and curated by Cortney Lane Stell. 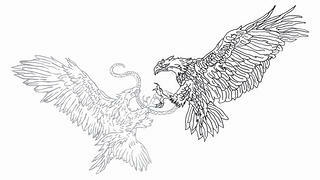 The solitary 60-foot flagpole hoists an enormous white, cotton flag that speaks to the deeply rooted history between the U.S. and Mexico—embroidered on one side by an illustration of a “Mexican” golden eagle and, on the other, an “American” bald eagle. During the three-month installation, the flag will become tattered and worn from its exposure to the elements. After its display in Socorro, Texas, Corral’s flag will be exhibited in museums and cultural institutions across the country. 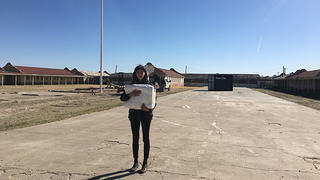 I’ve always had an interest in human rights, architecture and the type of facilities that housed people, humane or not. This project emphasizes the importance of recognizing and confronting the absences within our American history. The time I spent at the Künstlerhaus Bethanien residency in Germany exposed me to the complexities of history. When I saw the dilapidated buildings at Rio Vista they were hauntingly similar to the concentration camps. The decision to produce a flag from white cotton corresponds to its location. The Rio Vista Farm resides in the center of a cotton field. Mexican labors have been, and continue to be, a part of the very fabric of this country, along with others unrecognized. And the flagpole is located at the same place where welcome flags once stood. In recent years, a resurgence of interest in the U.S. government’s Bracero Program, in effect from 1942–1964, has resulted in new analysis, discourse, cultural practice, and heritage work surrounding the program. Following the National Trust’s Bracero History Summit onsite last year, this contemporary artwork marks another step towards raising awareness of the complex bracero experience at Rio Vista Farm—a place where close to 80,000 Mexican guest-workers annually were met with medical and psychological examinations, stripped of their clothing and fumigated with DDT before being bused across the U.S. to be hired as farmworkers in any one of the dozens of participating states.